An upgrade to the iPhone 5 from a previous version means searching for a new case. The old iPhone cases will not fit because the iPhone 5 is longer and thinner. This is no problem for me because my only criteria, besides securely encasing the iPhone, is for the case to include pockets to store an ID, a couple of bills, and a credit card. The Walletbook is advertised as part designer wallet and part premium leather case with pockets, easy device access, secure snap closure, and a money compartment making it an excellent replacement case candidate. As advertised, the Sena Walletbook is a designer leather wallet with a secure snap enclosure. 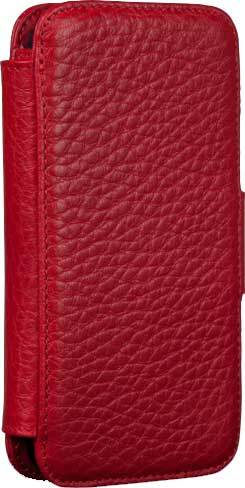 The red crocodile embossed leather case that I received is strikingly beautiful. It is available in fourteen different colors. The iPhone 5 slides into the case and has a leather flap that wraps over the top to secure the iPhone, leaving openings to access the power button on the top, lock switch on the side, and headphone and lightning connector port at the bottom. The pockets comfortably allow an ID and two credit cards with storage underneath for a couple bills. The Walletbook checked off every item on my wish list. The $54.95 price aligns with the price for other premium leather wallets. Using the iPhone while in the case is where some of my issues began. Initially, I found it awkward to hold the phone while in the case due to the bifold but found this was because I had more than 3 cards in the pockets. A major issue I had with the case occurred when I tried using a lightning connector adapter. The audio system in my car requires a lightning to 30 pin connector adapter. The leather strips at the bottom of the Walletbook blocked the connection to the iPhone 5. I had to remove the phone from the case to connect to the car audio system. Having to remove the phone from the case for use in the car then replace it in the case afterward is a major irritant. This also increases the risk of scratches on the phone. I love this case. This is why I began hounding my car dealer for news on when a USB/iPhone 5 cable would be available for my car. I love the sleek design of my iPhone 5. If I have to hide it in a case, it better be stylish. The Walletbook is definitely that.